Who knew losing weight and getting fiber into your diet could be so easy? You could win a consultation and full product line from celebrity nutritionist and PageDaily contributing editor Tanya Zuckerbrot. Watch the video above! I am a fan of PageDaily on Facebook. I shared the contest with over 100 friends on Facebook. I am a subscriber of PageDaily via Email. Thank you for offering your followers such a generous giveaway. To win the opportunity to work with a professional, learn how to improve one’s health and the quality of their life through sound nutrition, is the greatest and most precious gift in the world. Thank you for giving someone this rare and very lucky opportunity. 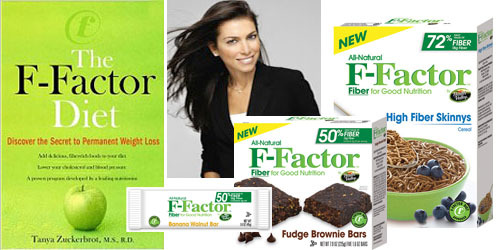 I am a subscriber of Pagedaily.com, and this F-Factor Gift basket giveaway is one of the reasons, why I love them!…I get to learn about products like that and to eat and live a healthier life! Thank You.